I don't think my skin ever feels as fresh and rejuvenated as it does after I use a face mask. There's something about that time of pampering that does so much for my skin. Nugg Beauty makes an entire line of face masks that only take 5-10 minutes to work their magic. The three masks I have are the Exfoliating, Deep Cleansing, and Soothing masks. 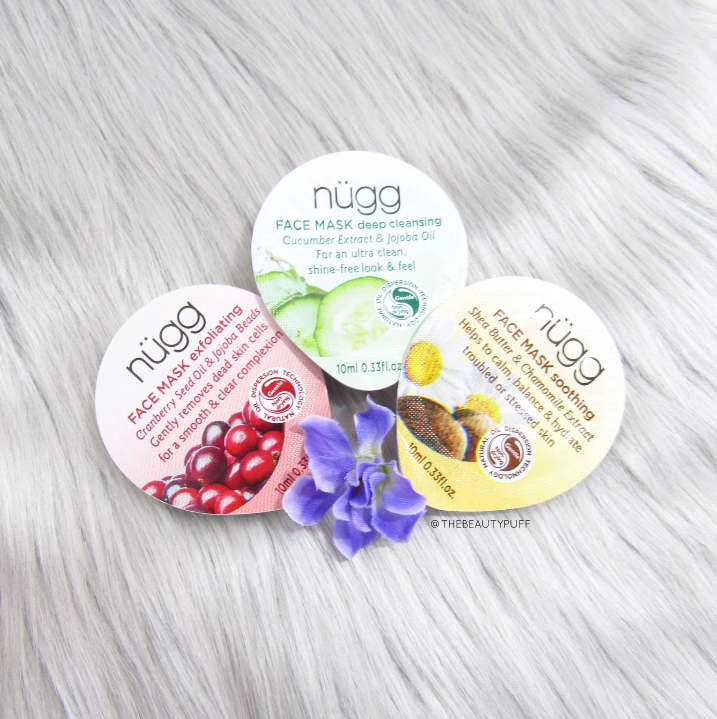 Nugg Beauty masks come in individual cups to keep them fresh and ideal for travel. You get plenty of product in each cup so you're sure to get thorough coverage every time. Simply apply the contents of the cup to the entire face and massage for about one minute. The masks only need to stay on for 5-10 minutes and can then be removed with a damp cloth. One thing I love about these masks is that they do not dry. They stay the same consistency from the moment they are applied until it's time for removal. This not only helps them wash off easily, but makes them extremely comfortable to use. I love how each of these masks benefited my skin. As someone with oily skin, I particularly enjoyed the Deep Cleansing Mask. I love how it helped to get rid of oil and made my skin feel clean and fresh. It will be a fantastic mask for spring and summer to give my skincare routine a boost! The Exfoliating Mask helped get rid of rough patches on my skin from the cold, dry winter air. If you're skin needs a fresh start for spring, you'll love how the jojoba beads gently exfoliate your skin. The Soothing Mask is a great mask for any time you need a little pampering. Great for that "mommy time" many of us treasure. There's something for everyone in the Nugg collection! Nugg Beauty masks can be found on their website as well as at Target.